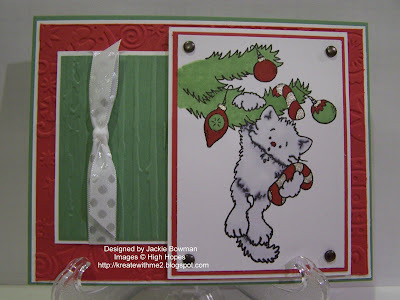 Today's 2 cards are for the Featured Stamper challenge over on SCS. We get to oogle their gallery and pick a card or 2 to case.....making some changes of course! After cruising America's gallery for a bit I chose Snowy Winter Retreat and Sympathy Blooms to case. Why did I choose these 2 particular cards....the layouts of course!! I LOVE different layouts and these 2 really caught my eye even though I changed them slightly. The image you see was sent to me by a supah sweet cyber friend and what a cute naughty kitty!! For those of you with cats, does this look familiar LOL!! I colored this adorable image with my markers and added a bit of sparkle along with some brads to finish it off. My layered panels are cuttlebugged pieces that I received from cyber friends too----love all my friends don't you?!! 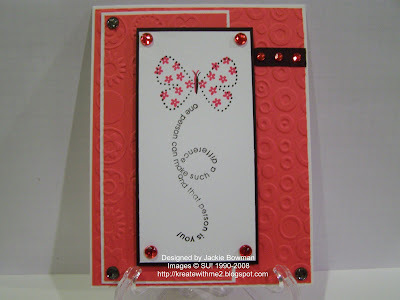 My second card features the Flight of the Butterfly ss along with cuttlebugged panels and bling. I love adding sparkle to my cards....I think it adds that extra little something that most of my cards need---I am my own worst critic and I'm working on that!! Thanks so much for stopping by and enjoy your Sunday! Oh~oh...what a naughty kitty! Reminds me of here....I spent all last night yelling at my kitties, this is their first tree! But they did make me laugh at there little shenanigan's!!! The card is so cute! The butterfly card I might have to case, I just got that set and haven't used it yet, I love your layout...TFS! Hey Jackie! And a happy Sunday to you too. Haven't been over to SCS yet and I don't usually do the Sunday challenge. Don't know why that is! Anyway, I love both your cards. That kitty is just adorable and the "Flight of the Butterfly" is one of my fav sets! I love your slide show too. I see things there that I missed at SCS - go figure - as I really live at SCS! Beautiful cards! I love the cuttlebugged panel! I love putting bling on my cards too! Both cards are lovely but I especially like the one with the butterfly. I really like your use of the CB folder. I've been using mine a lot lately. These two cards are just wonderful. I love the colors you used..and such sweet images! Great job. Great Cards. I love your slide show as well. Thanks for helping me with my blog, I finely got the layout I wanted! your coloring on the kitty is amazing! love both cards! I like how on both cards you used two diffrent embossing folders. Lots of extra interest. Nicely done...I love the CB touches...texture really gets me when I look at a card. Your cards are beautiful and your entire blog is very inspiring!!! Thank You for sharing all of your work! I added you to the places I visit on my blog so more people can enjoy your work! Both of these cards are beautiful! I love your coloring on the kitty card, and the cuttlebug bg's add such a nice touch. Love both of these cards, the naughty kitty especially! Great coloring and I love your layouts! Super Cute cards Jackie!! I love that butterfly one!!!! I love the hanging cat! He's adorable. Beatiful cards, Jackie! TFS. Jackie, these are adorable, love the kitty! Oh, yes they do like to get into the tree, it draws them like magents. The kitty cat is so cute! Butterflies are beautiful!